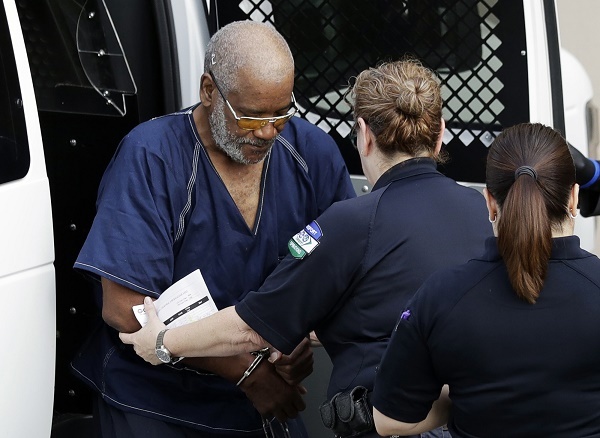 SAN ANTONIO (CN) – A truck driver accused of carrying 10 immigrants to their deaths in a sweltering tractor trailer in July pleaded guilty Monday to human-smuggling charges. James Matthew Bradley Jr., 61, pleaded guilty in San Antonio federal court to one count of conspiracy to transport aliens resulting in death and one count of transporting aliens resulting in death, according to the U.S. Justice Department. U.S. District Judge David A. Ezra accepted Bradley’s plea but set sentencing for Jan. 22. He faces up to life in prison. Eight male immigrants were found dead inside the scorching hot enclosed tractor trailer that Bradley drove from Laredo to a San Antonio Walmart in the early morning hours of July 23. Two others died later at area hospitals and 29 more were injured. Some of the immigrants took turns breathing through a hole in the trailer wall, according to the criminal complaint against Bradley, of Clearwater, Fla. Another immigrant told authorities that there were approximately 180 to 200 people in the tractor trailer at one point. Bradley’s plea on Monday afternoon is a turnaround from his initial court appearance in July, when he denied any knowledge of the fatal human-smuggling attempt. Bradley told police that he was unaware of the contents of his haul until he heard “banging and shaking in the trailer” after exiting the vehicle to urinate, according to the criminal complaint. He did admit to knowing that the trailer’s refrigeration system didn’t work and that the four vent holes were probably clogged up. The heat inside the tractor trailer exceeded 100 degrees. Federal prosecutors say Bradley now acknowledges that he transported undocumented aliens in the United States for financial gain and to further their illegal entry into the county, which resulted in the deaths of 10 undocumented aliens. Bradley’s co-defendant, Pedro Silva Segura, was indicted last month in connection with the human-smuggling operation. Segura, an undocumented immigrant living in Laredo, was charged with two counts of conspiracy and two counts of transporting undocumented aliens resulting in serious bodily injury and placing lives in jeopardy. “This case is a glaring reminder that alien smugglers are driven by greed and have little regard for the health and well-being of their human cargo, which can prove to be a deadly combination,” Folden said in a statement Monday.